Tags are great to have on your stamping work surface. You can always print a second image on one, clean off your stamp, or just get it inky instead of scrap paper. Maybe you can use it for a later project! Best of all, they are inexpensive. So if it's just a mess, no big deal. 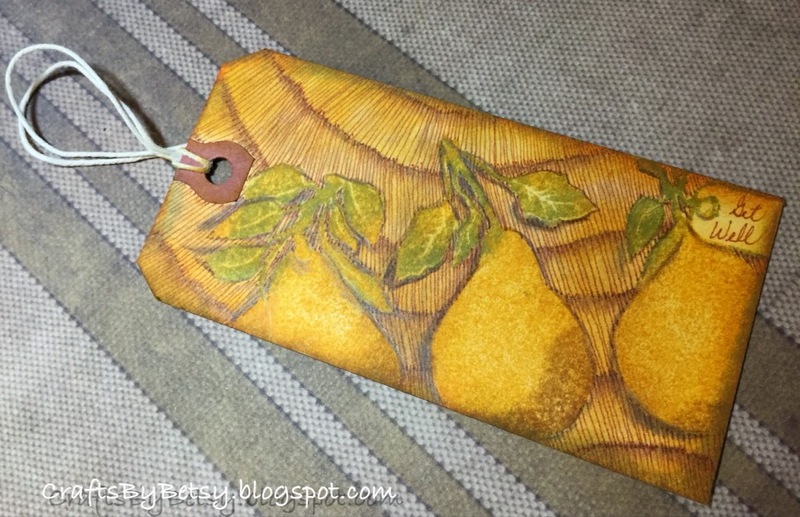 The pears are a stamped image from A Stamp in the Hand called Pear Border #2. I tangled the pattern Athitzi, by Seven, in brown Sakura Micron and added lots of layers of colored pencil and Ranger Distress inks and alcohol inks. This is my second Athitzi contribution for The Diva Challenge #203. Be sure to check out the other interpretations! I love this tag! I like the idea of using stamping with tangling too. I have been a stamper for more years than I care to admit so perhaps I should try some of these ideas out too. The color on your tag is perfect and your Athitzi makes for a beautiful background. Wonderful tag! So clever idea! I like it! This tag is really beautiful, great use of Athitzi.